And for those of you who don't celebrate Easter, HAPPY SPRING! Be sure to check out this year's Peeps diorama contest at the Washington Post. It's even better than last year's! And you can vote for your favorite, too! (Mine: Nightmare in Pink) I am definitely entering in 2009. Can you imagine: Kiki Strike & The Irregulars as Peeps! Why thank you! I am happy. LOL. It snowed like 6 inches the first day of spring, it was weird. There's this "edible book" thing in the end of march, and I'm making a "Shadow City Cake". It will have tunnels in it and stuff. It's gonna be awesome! Spring: You MUST send me a picture! That sounds unbelievable! Awesome! I actually really like the Egypt one. I am going to make one next year! i already know my theme. 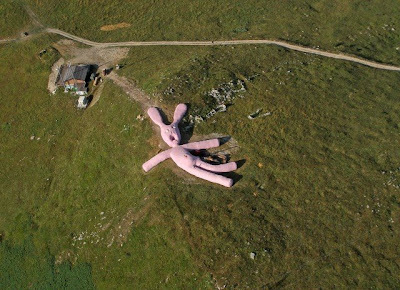 Hey- I was just reading about the giant pink bunny! THAT IS WICKED AWESOME! Once I am not posessed by the parental units, I am going to do waht it said in the article-clinb up it's sides and rest on the top! That diorama contest ROCKS! I am so impressed! OMG! I LOVE the Peep contest! Way better then last years. I voted for Venus de Peep. They were all awesome though. Next Year, I am totaly entering! But, guess what, I was right! This is the 1st year in my life that I didn't get Peeps for Easter!! And, also, the first year I wanted some. Ironic. The punny is totaly awesome. I am so gonna climb it when I'm older. Once I'm up, I will rest on it's nose, then slide down it's ears!! How tall is it? Wow, that was a long post. Next year I will SO vote for you if you do a Kiki Stike diorama! Happy Spring, everyone!!!! Those peep things were really cute. Hania: They are super-sugary marshmallow candies shaped like chicks and bunnies. They're disgusting (in my opinon). You're not missing out! And now that you mention it, I could really go for some cake, too! My brother tried peep jousting and it failed horribly. Neither poked each other, so we had a race to see who would asplode first. And, if you know whoever did the chocolate-bunny-cide video, it would be cool if they dipped one in lava. This has nothing to do with spring, but this kid from my class was looking at college course (don't know why, we're in middle school) and there's a class called Psychopathology 101. I'm not kidding. The peeps are amazing! My fave was the ghoststory one. EYES ON TREES. also, a great website is icanhascheezeburger.com. i think you'll like the pepsi-takes-over-fridge Ananka. IT- college course??? In middle school??? What the heck is psychopathology, anyway??? I'm taking a GCSE in Psychology, but thats not really for college. is that cool or what???!!!!?!?? And happy Easter to you, too and it SNOWED on Holy Saturday and it SNOWED today (being Easter Monday) and I think it might have snowed yesterday. Did anyone like the Project Peepway one? that is the best show in the whole world! Bunny... I wanna lie on it too! Move over tourists! XD The pink bunny reminds me of another cartoon that the same artist that created "Making Fiends" (I think you posted something about that, right?). I think it's called... "Big Bunny" or something. This is rather random, but did you know that if you put a Peep in a vacuum, it expands to over twice its size? And then when you let air into the vacuum and it's not a vacuum anymore, the Peep shrivels up. It actually tastes better that way. Patsee: How on earth did you figure that one out? And where did you find the courage to actually EAT one of the vacuum peeps? I'm in awe. Why Can't You Find a Bear When You Need One?